Oh, matcha, one can never have enough. Luckily there are many places to satisfy my matcha needs in Tokyo. Except for Saryō Kagurazaka, the places I introduce in this article do not traditionally originate from Tokyo. 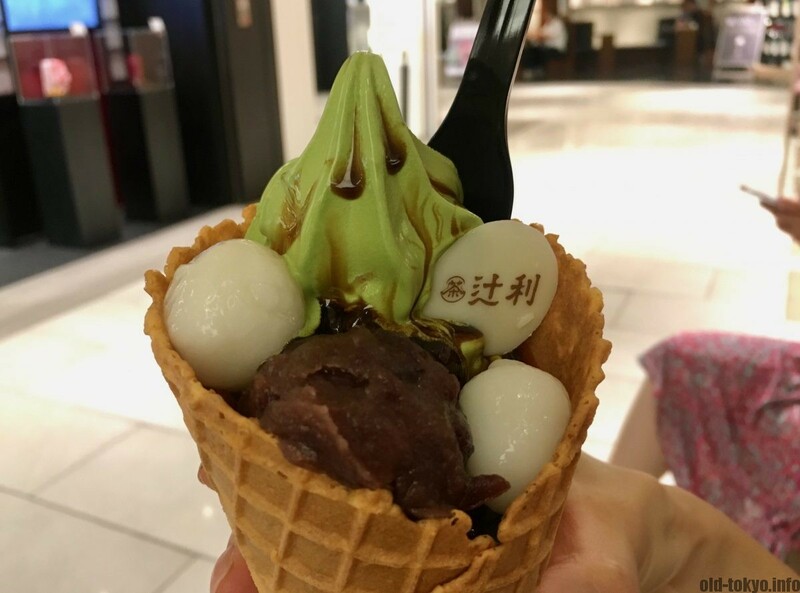 However, thanks to the popularity of matcha, the capital has become the place to be to sample all types of matcha desserts and ice cream. 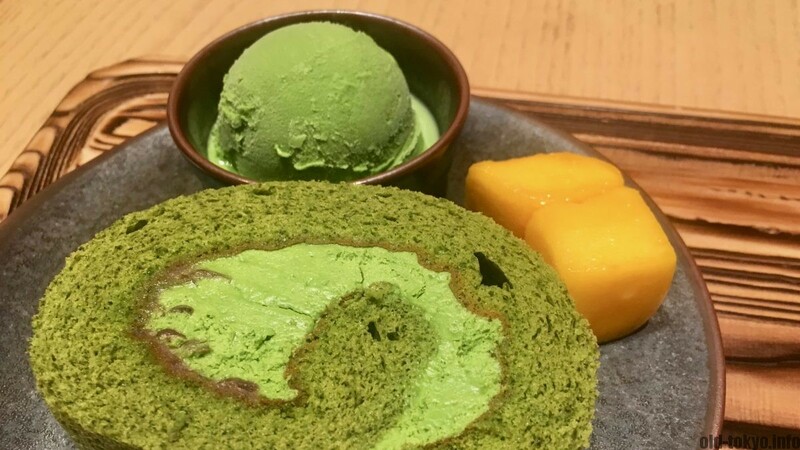 This article focuses on matcha dessert to follow up on my article on matcha ice cream. I selected 4 places that I enjoy very much. This is by no means a comprehensive list, but I am sure you will not be disappointed at any of these places. Saryō Kagurazaka is a sweets cafe specializing in matcha established in the early 2000s. Their first cafe was opened in Kagurazaka, the French quarter in Tokyo and hence the Kagurazaka component in their name. 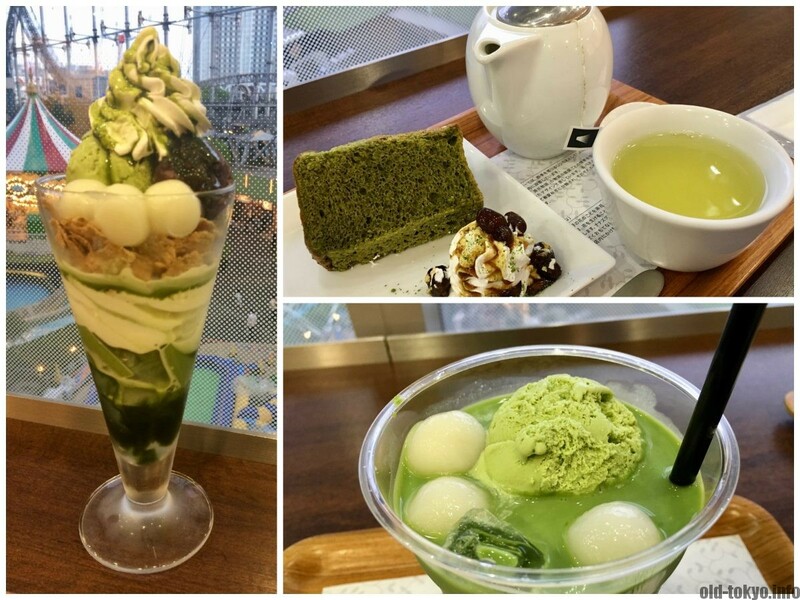 The fancy matcha desserts fit well with the upscale feeling of the neighborhood. Saryō Kagurazaka evolved into a chain with 9 cafes in and around Tokyo, 1 in Nagoya, 1 in Fukuoka and even one in Singapore. It is worthwhile to visit the original cafe in Kagurazaka as it is located in a beautiful old wooden building with lots of space. It gets very crowded during the weekend, so I suggest to go on a weekday or in the evening. The star of the show is the matcha fondue, a mix of Uji matcha and white chocolate in which you can dip assorted sides. The matcha parfait is also pretty good. I appreciate the absence of cornflakes. At many places in Japan they fill up the parfait with cornflakes, a practice for which no word is strong enough to condemn. They also have a wide variety of teas and even alcohol, quite uncommon for this type of cafes and especially inviting to come here during the evening. Please note the menu differs slightly depending on the location. They usually have all the matcha sweets, but it seems alcohol is only available in Kagurazaka. Opening times are also different, Kagurazaka is open until 23:00, most other locations close at 21:00. 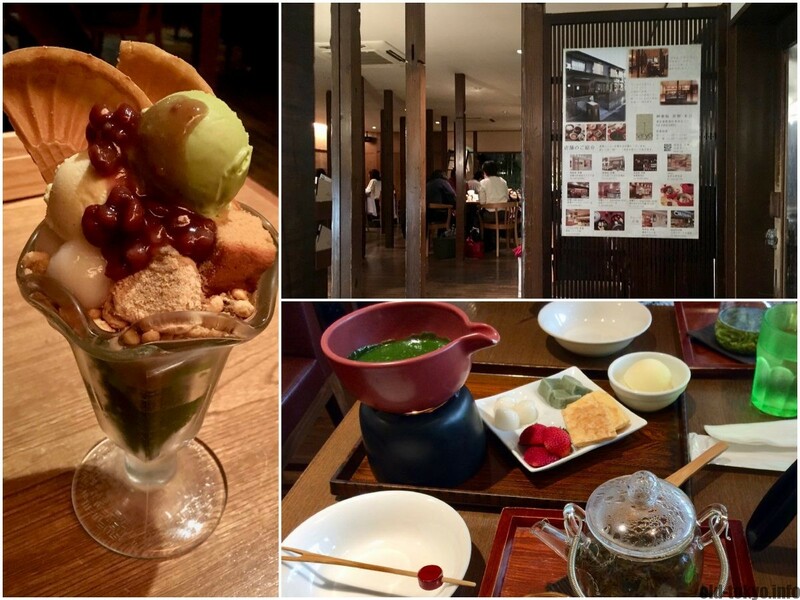 The matcha parfait, matcha fondue and the Kagurazaka cafe interior. Other locations: Shibuya, Ikebukuro, Shinjuku, Kichijōji. Anything special when ordering? No, get seated and order. Pay at the cashier when you leave. Kyō Hayashiya was originally a tea shop in Kanazawa established in 1753. It moved at the end of the 19th century to Kyoto and from that moment onwards it started developing into the shop it is today. They caught my attention as they claim to be the first ever to make a matcha parfait. That was 1969. In 2018 they are operating 11 cafes: 8 in and around Tokyo, 1 in Kyoto, 1 in Fukuoka and 1 in Hong Kong. The matcha parfait is indeed the one thing to get. I must say wow, the taste of this matcha parfait is really breathtaking. You can go for a parfait with extra rich matcha as well that is very satisfying (JP 1500 when I visited). Several other deserts are available as well such as roll cakes. They have the parfait also in the hōji-cha version. In central Tokyo Kyō Hayashiya has 3 locations: Hibiya Midtown, Meguro Central Square and Seibu Ikebukuro. The menu is slightly different depending on the location. Matcha and hōji-cha parfait and roll cakes in Kyō Hayashiya. Several items are only available until 20:00, such as the parfait! Anything special when ordering? No, just get seated and order. Pay at the cashier when leaving the store. Tsujiri tea brand from Kyoto was established in 1860 by Riemon Tsuji in Uji. It is the foremost green tea brand with stores in London, Toronto, Melbourne and of course all over Asia. Unfortunately, the brand seems not tightly controlled so you have no idea what part of the heritage you get a taste of. I found at least 4 different companies that are using the name. The reason for this is that family members and students of the master received permission to use the name. Nevertheless, from what I have tried so far, the quality seems to be there. There is a stand (with limited seating) in the Ginza Six department store and a cafe in the Daimaru department store (right next to Tokyo Station). The Kyō Parfait from Tsujiri. Anything special when ordering? Order at the counter. There is no dedicated seating area, but right across the shop are blocks on which you can sit and everybody seems to eat there. 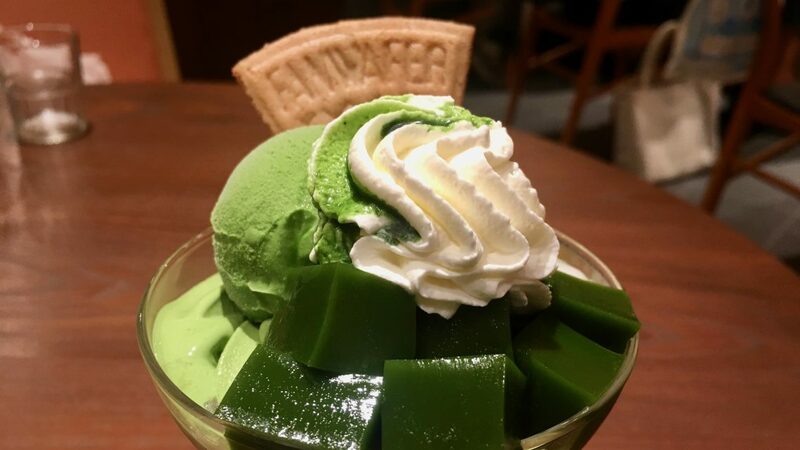 As in my article on matcha ice cream, Nana’s green tea is also a good place overall for matcha desserts. They have many stores all over Japan, and even ventured in China, Malaysia and Singapore. 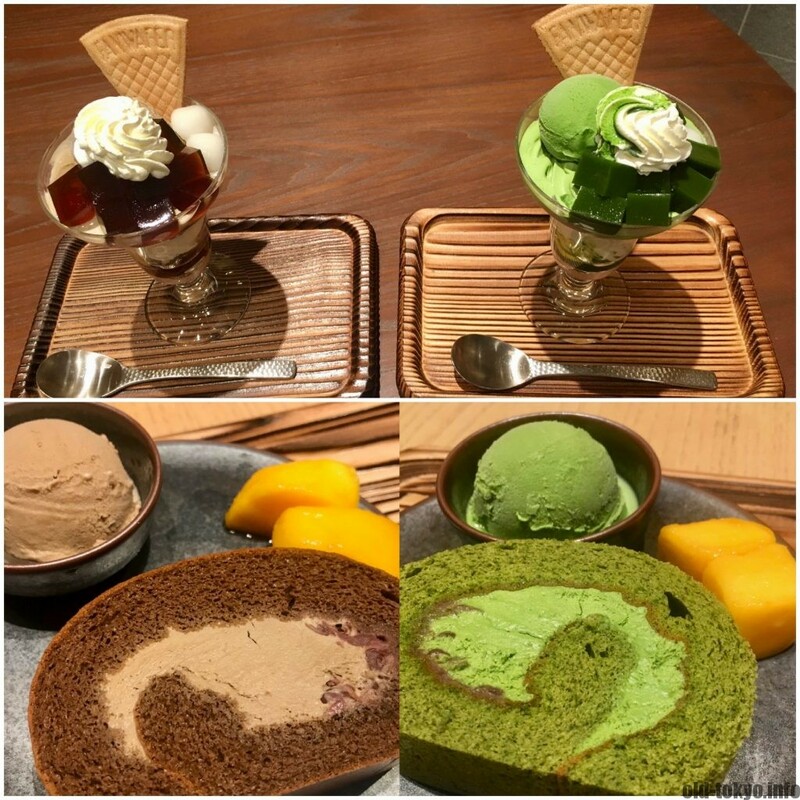 Next to their matcha and delicious frozen matcha lattes with ice cream, they have a whole range of parfaits (both matcha and hōji-cha) and other types of sweets (such as chiffon cake, gateaux chocolat, swiss roll). There are currently (summer 2018) 14 cafes in Tokyo. They all offer the matcha sweets except the one in Odaiba that only has drinks. For central Tokyo there is not a lot of choice: Marui in Ueno (listed below), L’Aqua next to Tokyo Dome and Wing Takanawa EAST in Shinagawa. The other locations are away from the centre such as Kichijōji, Machida or the shop in Tokyo Skytree. Matcha parfait, chiffon cake and matcha latte in Nana’s Green Tea. Anything special when ordering? Order at the cashier first, you will then receive a number that you put on your table, after which the waiter/waitress will bring the goodies to your table.